Edward Brooke-Hitching is a map collector and author of Fox Tossing: And Other Forgotten and Dangerous Sports, Pastimes and Games. A Fellow of the Royal Geographical Society and a writer for the popular BBC TV show QI, he lives in a dusty heap of old maps and books in London. "Ever seen a map of the flat world? Or an illustration of the 'Patagonian giants,' a race of nine-foot-tall humans that graces 16th-century maps of South America? In his curious, illustrated book, Brooke-Hitching explores the map mistakes of yore, from innocent mistakes (fog that sailors mistook for islands) to straight-up lies (fake countries, dreamed up to trick investors out of money)." "What makes Brooke-Hitching's book more than just a collection of oddities is the emphasis on why these errors happen, and how relying on religion at the exclusion of science, or valuing outsider reports ahead of indigenous knowledge, detrimentally impacted centuries of exploring." "This collection of cartographic errors from maps throughout history provides an entertaining glimpse into the spread of misinformation during the age of exploration....Cartophiles will find much to amuse themselves." "The Phantom Atlas also provides a fascinating glimpse into the history of map making, and how our view of the world has evolved to the picture we have today. Editing is a laborious task even today, and one can only imagine how tough the task was in the Middle Ages, as cartographers only had limited information and the anecdotes of wayward seafarers. The temptation is often strong to simply embellish and fill in the gaps on maps with islands and lands that, while they tell a good tale, simply do not exist." "Maritime map fanatics rejoice...this compilation of lively, skillfully illustrated stories about myths, mysteries, and imaginings as recorded on maps holds something for everyone, young and old." "In this atlas of the world 'as it was thought to be,' cartophile Brooke-Hitching documents the persistence of fictitious places-Sandy Island in the eastern Coral Sea, for example, 'existed' a full seven years after the launch of Google Maps. Early ghost places are understandable, explains the author-maps exaggerating the might of God's creation were common in the Middle Ages, for instance, and the dearth of accurate instruments on early ships are another culprit, as sailors often took mirages or clouds as landforms. Maps showing such intentional or accidental slips are apparently legion, and 58 of them, marking well-known "places" such as Atlantis as well as real locations that were mapped incorrectly ("Korea as an Island") are reproduced in color here, with the mistake (or wholesale fabrication) outlined in a few absorbing pages per entry... An intriguing look at how maps can shape our worldview." "From the magnetic mountain at the north pole to Australia's inland sea, Edward Brooke-Hitching charts five centuries of misrepresentative maps." "Fascinating...Mr. Brooke-Hitching, by examining these erroneous maps, delves deep into the history of exploration and the fantastical misconceptions of cartographers." 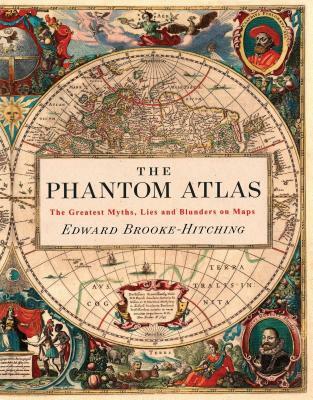 ""The Phantom Atlas" will prove rewarding for armchair adventurers and nautical historians. For more intrepid souls, it affords an indispensable guide to legendary sites or, just possibly, remote realms waiting to be reclaimed. Don't forget to bring a camera." "The Phantom Atlas is charmingly written, stunningly illustrated, and elegantly presented (kudos to designer Keith Williams). Even if your passport is stamped to a fare-thee-well, this beguiling book will be an eye-opener - one eye for Arimaspi, four for Nisyti. It tempts travelers toward destinations they will never reach."